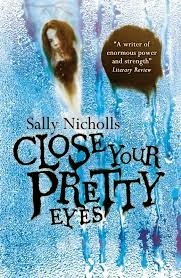 Sally Nicholls's stunning Close Your Pretty Eyes was one of my favourite books published last year - although it took me until this year to get round to reading it. Otherwise, it would definitely have been a strong contender for my year-end awards. I'm still trying to marshall my thoughts over such a fascinating read into coherent form for a recommendation, but it's one that all fans of YA should read! I was delighted to set up an interview with Sally. My readers are a varied bunch! I suppose my average reader is probably a clever girl of about twelve or thirteen. But I’m also read by boys. And a lot of adults. Close Your Pretty Eyes has been very received by adults involved in foster care, and also by librarians. 2. Olivia was the latest in a long line of unreliable narrators I've loved. Who's your own favourite unreliable narrator? Well, one of the inspirations for Olivia was Tracy Beaker, of course. The Story of Tracy Beaker is a masterclass in how to write an unreliable narrator who’s unreliability can be understood by a reader as young as eight or nine. For adults, probably Eva from We Need to Talk About Kevin. The scene where she takes the pre-school Kevin to a restaurant is particularly chilling, as you suddenly see how normal this ‘abnormal’ child of hers probably is – or is he? I've never actually read WNTTAK, but that's a fascinating recommendation for it - will definitely keep an eye out! 3. Through flashbacks to Olivia's experiences before going to live with her current family, we see a wide range of experiences in foster care. How much research did you do into foster parents? A lot. I read as many biographies of foster care as I could find, and a lot of online blogs written by foster parents, adoptive parents and foster care survivors. It was heartbreaking to see the same stories come up again and again, and to see the different ways the child and the adult would describe similar events. The adults writing about their childhood in foster care were fascinating examples of real-life unreliable narrators – as far as they were concerned, they’d been abused and mistreated by every foster family who hadn’t kept them, and you got very little of the reasons why so many of their placements had broken down. I was never sure how deliberately they were working to engage the sympathy of their readers, and how much they honestly believed they were blameless. It’s one of the most fascinating things about this sort of mental illness – when you have the emotional capacity of a toddler, as Olivia does, what you need and expect is an adult who will treat you with as much love and forgiveness as adults routinely treat two-year-olds. But of course, when you’re an angry, violent eleven-year-old, adults quite reasonably need you not to behave like a toddler. And this disjunct only grows harder as you get older. 4. And similarly, how much research did you do into the topic of baby farming before writing the book? Less. I read a biography of Amelia Dyer, which told me as much as Jim knows, which is as much as Olivia knows. That was quite enough! 5. I found the portrayal of Olivia's mother to be really interesting, but she made my skin crawl. Who do you think are the worst parents in YA fiction? Ooh … There are quite a lot. Worst father award goes to the father in Margo Lanagan’s ‘Tender Morsels’ who I’d say is worse than Olivia’s mother. Worst mother to the mother in Anne Cassidy’s ‘Looking for JJ’, who also makes my skin crawl. I was shamefully late in getting around to Looking For JJ, finally reading it last month, but totally agree! Tender Morsels is also on my TBR list. 6. Close Your Pretty Eyes is a really chilling read at times, which scared me! (Although I know I'm easier to scare than many kids less than half my age are...) The discussion about age ratings on books has recently sprung up again. Where do you stand on the topic? Is there an age at which you'd say children were perhaps too young to read a book like CYPE? I think it’s fascinating. I think age banding is a really positive thing for booksellers and librarians, for adults who don’t know much about book-buying (and even those who do) and for the children who might not otherwise get books bought for them. It is hard to judge the age a book is aimed at even if you know a lot about children’s books – as Michael Rosen demonstrated when he recommended Jacqueline Wilson’s ‘Girls in Love’ to an eight-year-old on a television debate about age banding. And of course bookshops divide books by age already – and often inaccurately. I’ve seen Philip Pullman’s younger fiction routinely shelved in Teen. But I do think it’s a negative thing for children – who are usually pretty good at deciding what books are the right age for them. Children whose parents want them to ‘read up’, children who want to read books which are ‘too young’ for them, children who can’t read books which are the ‘right’ age for them all suffer. And then there are the books like my first novel, Ways to Live Forever, which is a 9-12 book in America, a YA novel in the UK and an adult book in Spain. I’m very grateful that doesn’t have an age band on it. I think there are definitely children who would be too young to read Close Your Pretty Eyes – of course there are. But how old that is will vary from child to child. 7. Olivia is younger than the majority of YA protagonists. I've seen suggestions that children won't read about main characters younger than themselves but it definitely doesn't seem to have affected people's enjoyment of Close Your Pretty Eyes! Did you ever consider ageing her up or was it important to you that she was still relatively young? In the first draft she was ten. My editor asked for her to be older, but we felt it was important that she was still in primary school, which is why she’s eleven. Her childishness and vulnerability are important to the story, I think, as she’s such a hard character to like in so many ways. I find it quite frustrating that the age bands in this country are 9-12 and YA. UK authors are actually very good at books which span those brackets – 11-13, perhaps – which is where I’d put books like the Harry Potter series, His Dark Materials, Hilary McKay’s Casson Family series and Watership Down – and probably Close Your Pretty Eyes and Ways to Live Forever. I understand the logic behind ‘reading up’, but I do think it’s bizarre that it’s so common for children’s books and films to feature adult characters – just look at superhero movies and fairy tales - and it’s certainly accepted for adult books to feature child characters, but teenagers are believed to only be interested in teenagers. I don’t think that’s true at all. Agree completely there! There are so many AMAZING authors writing for that 11-13 or so age range. 8. This is one of those questions which I've spent a few weeks struggling to phrase without spoiling the book, and may have messed up, so feel free to ignore it! Did you always know you'd end the book at that particular point, rather than giving more of a 'closed' ending? No. In my synopsis the ending was more resolved. But – well, there are two ways the story could end, and neither of them felt very honest. One felt too ‘happy’ and dishonest to the experiences of many children like Olivia. And the other felt too ‘sad’ and dishonest to the growth and learning that Olivia goes through in the book. And actually the hero’s journey, if you will, was getting Olivia to the point where the book ends. That was the important part. I was so pleased when I figured out how to end it. I knew that was exactly the right ending, and most people have agreed. I definitely do! A superb way to finish things off. 9. One of your upcoming releases is a story in the anthology War Girls, which looks amazing! How did you get involved in it? Well, I wrote a story for another Andersen anthology about the afterlife, Next, which they liked. Keith Gray asked me to write for that because I’ve written about the afterlife before, in Ways to Live Forever. And then Charlie Sheppard at Andersen heard me talk about my historical novel, All Fall Down, at a librarian’s conference, and asked if I’d be interested in writing a historical story about World War One. I actually cheat a bit – my story is about the two million ‘spare women’ who were left without a husband after the War. They’re a subject that fascinates me, so I was delighted to be allowed to write about them. Sounds an intriguing story! Can't wait to read it. 10. What's next for Sally Nicholls? War Girls comes out in June. I’ve also got a short novel about a teenager in foster care, Shadow Girl, which is published by Barrington Stoke in May 2014. Right now I’m working on a novel called Stone, Paper, Ninjas, which is a contemporary family story. It’s about a twelve-year-old who’s being raised by a nineteen-year-old brother, and is helping to raise a seven-year-old. And there’s also an adventure element. But, sadly, no ninjas. Oh, brilliant! All three sound wonderful, perhaps especially Shadow Girl for me; I'm trying to read more Barrington Stoke at the moment as they're such a fantastic publisher. Thanks so much for taking the time to talk to me, Sally! Sally can be found on her website and on Twitter.